Florence is filled with hidden attractions that most of the travelers miss, in their rush to complete their “must-do” checklist. 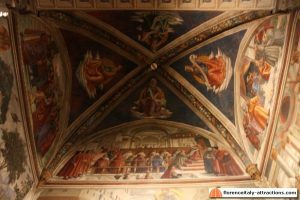 The goal of this blog is to help you discover these magnificent places, and one of them, for sure, is the Sassetti Chapel in the church of Santa Trinita. 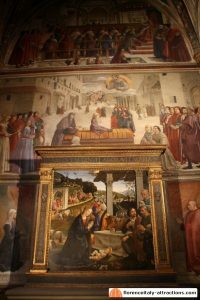 Without staying in line and without paying any ticket, you will have a chance to see a wonderful cycle of frescoes by Domenico del Ghirlandaio and learn something about the Medici family and their entourage. Francesco Sassetti (1421-1490) was a banker, initially partner of the Medici, who thanks to Lorenzo de Medici became the director of the Medici Bank in France. He managed the branch of the bank in Geneve and then Lyon, before becoming the General Director of the Bank in 1469. He was not a great manager, delegating too much to other managers so that in 1488 the branch of Lyon was at serious risk of bankrupt. Despite this, Lorenzo de Medici always trusted Sassetti and the two were good friends for all their life. In 1478, Francesco Sassetti bought the patronage of a chapel in the church of Santa Trinita and hired the painter that was considered the best at that time: Domenico del Ghirlandaio. The chapel, meant to be his burial place, was decorated with the stories of St. Francis between 1483 and 1486. The fresco cycle of the Sassetti chapel unfolds on three walls framed by fake architectural elements. Even the altarpiece of the table, the Adoration of the Shepherds, is surrounded by a frame recalling architectural marble elements. The theme of the decoration is essentially twofold, but similar then, ultimately, to a common reflection on life, death and rebirth. Most of the frescoes show the stories of St. Francis, a theme that was linked to the name of the customer, while the theme of the coming of Christ, connected to events in the life of Sassetti, is closely linked to the cultural climate of the Neo-Platonic Academy and the political situation in Florence, as a new Rome, with a celebration of peace and the new Golden Age under Lorenzo the Magnificent. Ghirlandaio also merged the philosophical-religious theme with a purely historical theme, that captures the Sassetti family and the Florentine society with portraits personified in the various characters of the scenes. On the outside wall of the Sassetti Chapel, above the arch, there are two frescoes which are part of the cycle. The condition of these scenes is bad because they were whitewashed in the eighteenth century and rediscovered only in 1895. These decorations, placed on top of a coat of arms of the Sassetti, in polychrome glazed terracotta, also had the function of attracting the attention of the spectator from the naive to the chapel, which is located in a bit tight angle. 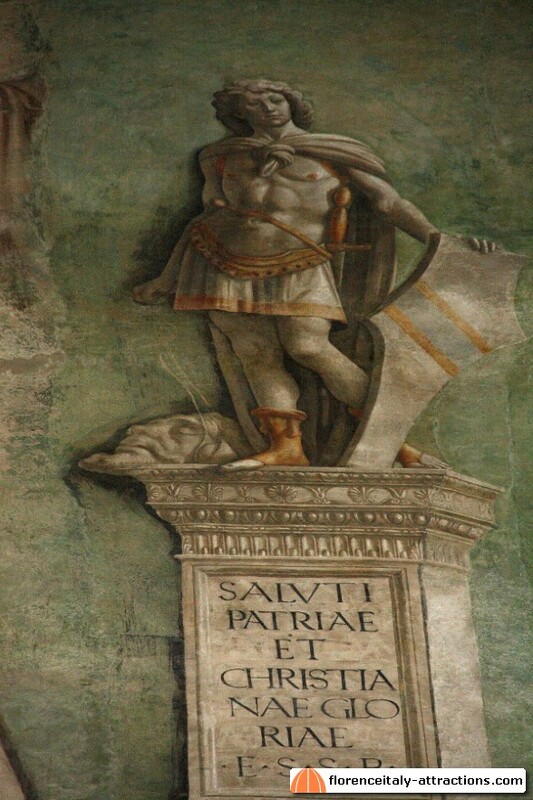 Above the pictorial continuation of the pillar that separates the Sassetti chapel from another one, with a Latin inscription, there is a figure in monochrome of David, made with the technique of grisaille and gilding on shoes and the armor, made to look like a statue. 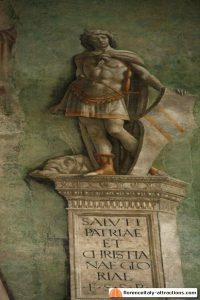 The Biblical hero is armed with a sword and with a sling stone while his left hand holds a shield with the Sassetti symbol. Below the feet is the head of the giant Goliath beheaded. Its function is three-fold: in addition to presenting the entrance of the mausoleum with the heraldic shield, announces, as a prophet, the Nativity of the altarpiece, as is evidenced by the inscription on the pedestal, and takes on the role of defensor civitas, as he protected his population from the threat of the giant Goliath: there is a long tradition regarding the town of Florence and David, as a symbol of freedom against external threats: famous versions are the sculptures by Donatello (1440), Verrocchio (1472-1475) and Michelangelo (1501-1504). The fresco in front of the chapel represents Augustus and the Sibyl Tiburtina announcing the birth of the Lord. Against the backdrop of a landscape that is now difficult to read because of the conditions of the work, the fresco represents the Campidoglio in Rome, and there are two groups of characters: to the left Augustus and two men, to the right the Sybil Tiburtina (which could be a portrait of the daughter of Francesco Sassetti that was called just Sibilla) and two women. They set and indicate the sun, where the trigram of Christ described by St. Bernardino is appearing. According to the legend, in fact, the Emperor would come to know of the birth of a new redeemer thanks to Sybil, so the Sun would represent the dawn of a new era of harmony. The prophetic theme continues in the time where there are four Sibille, against the background of a blue sky (now red in some places because of the fall of the original pigment) between ribs decorated as garlands of flowers and fruit. Each is depicted sitting on a throne of ideal clouds, in front of a nimbus of light that emits golden rays. They hold scrolls with prophecies in Latin about their prophetic role described by Virgil. The first Sibyl above the entrance is the Sibyl Cumana, the most important being linked to the prophecy of Virgil, and the other ones are Eritrea and Agrippa while the fourth identification is uncertain. Regarding the pictorial quality of Sybils, only the faces seem made by Ghirlandaio, while the bodies with incorrect proportions, with the drawing of the hands a little uncertain, suggest that the workshop executed these frescoes. The theme of the advent of Christ then ends in the altarpiece, dedicated to the Adoration of the Shepherds and dated 1485. The sarcophagus, the triumphal arch crossed by the court of the Magi and the pillars that hold up the hut are specific references to the birth of Christianity in the pagan age. These classical references were probably suggested by Fonzio, one of the scholars at the court of the Medici, representing, with other symbolic elements, the transition from Jewish and pagan religions to Christianity, built on the ruins of other confessions, as remembered by the classical ruins. Even the distant landscape, with views of Jerusalem and Rome, symbolizes this allegory. In the figures of shepherds, Ghirlandaio inserted his own self-portrait, the first of a long series, pointing at the Child. On either side of the altarpiece are the two kneeling patrons: Francesco Sassetti, right, and his wife Nera Corsi, left. The two portraits are characterized by severe lines: Francesco is dressed in red, with folded hands, his face severely absorbed, shaved head. His wife has typical features, wearing a black dress, her head covered by a simple white cloth as used for older women. At the bottom of the frescoes, you can read the date, exactly the Christmas of 1480, a symbolic date linked perhaps to the committee at the beginning of the work. Center right wall – Death of St. Francis. The cycle of the Stories of St. Francis starts at the top of the left wall of the Sassetti Chapel, depicting the young Francis who abandoned all his goods publicly stripping off clothes while protected by the Bishop of Perugia Guido; his father Pietro Bernardone, a rich merchant, is angry and held behind him by some individuals. We can’t understand if Francis’ father is supported, as if he was already resigned to the fate of his son, or if maybe it’s the common lack of drama in the works of Ghirlandaio, especially in the scenes in which the contributions of assistants is more pronounced. Various supporting characters crowd the lunette, but without taking part in the action, perhaps by the brothers of Domenico and the workshop. 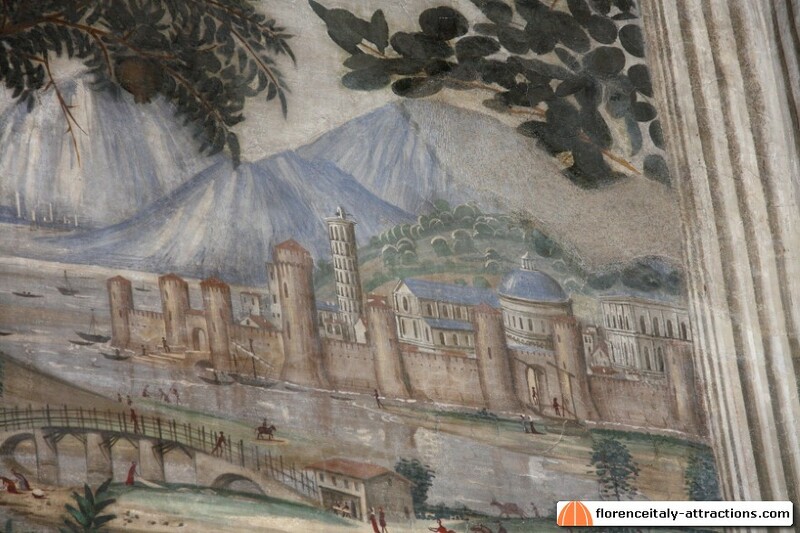 The scene takes place against a background representing a northern city that has been recognized as Geneva or Lyon where Sassetti had worked for the Medici. A similar view is in fact in the Portrait of Francesco Sassetti and his son, today at the Metropolitan Museum in New York. Still on the left wall the fresco depicts St. Francis kneeling with his arms open to receive the divine sign of the stigmata from the crucifix appeared in a nimbus of a group of Seraph angels. It was performed in ten days and while following the setting of Giotto in Santa Croce, Ghirlandaio seems to prefer as a model the marble relief of the pulpit, also in Santa Croce, by Benedetto da Maiano. 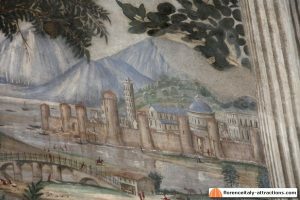 The miracle took place at La Verna, whose fortress is faithfully reproduced in the center of the background, with a remarkable naturalistic representation. On the right you see a town on a lake, a fanciful representation of Pisa which is recognized quite clearly with the Duomo and the Leaning Tower. That’s a strange thing, given that La Verna, where the miracle happened, is not close to Pisa but close to Arezzo, in a territory that, at that time, was part of the Republic of Florence. The pictorial realization is excellent, even in the more difficult parts as the faces, the thin hands of the saint and the drapery, with a quick brushstroke peculiar of the expert teacher. The divine light of the appearance leads some magical reflections on the face of the saint and his cloth. Also to be noticed is the ability to represent a deer, while birds flying in the sky are related to the theme of the harmony of the natural cycles, also present in many other Renaissance works. The Confirmation of the Rule, with the Miracle of the revived child, occupy the central wall of the Sassetti Chapel and are the most representative of the entire cycle. 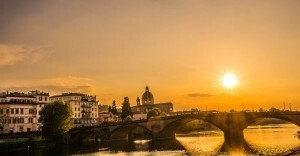 Both are set in a very precise Florentine landscape. The confirmation of the rule is in the lunette on top of the central wall. The scene is framed with great skill and originality, in an open porch, causing the arch of the chapel look like an arch of the church which opens on the scene. The scene is set in Florence instead of Rome, with a clear representation of the Piazza Della Signoria in the background, with the Loggia Della Signoria (still without statues) in the center and Palazzo Vecchio on the left, behind which you can see the aspect of the church of San Pier Scheraggio before it was destroyed to make room to the Uffizi. The Marzocco (statue of a lion) by Donatello is presented here and on display in front of Palazzo Vecchio. People represented in the background, performing their daily activities, give the scene a great realism. 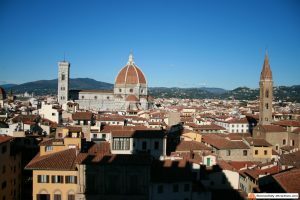 The decision to set the scene in Florence indicates the importance given to the city, which in the humanist circles was regarded as the new Rome, or New Jerusalem, or new Athens. The presence of the Pope and cardinals in fact, confirms the role of Florence as a center of spiritual renewal and a political environment in which the example of St. Francis was revived by the most important people, such as the Medici and Sassetti. 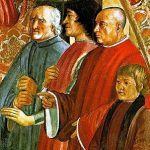 This “new reformed Christianity” is what results from the theories of Marsilio Ficino, whose intellectual achievements and moral humanism fueled the Renaissance of the Italian culture. 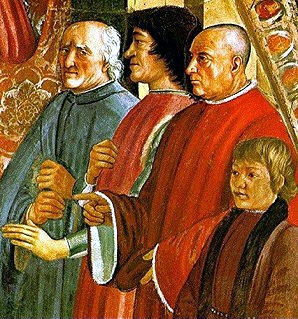 To the right in the foreground we can see the Minister of Justice Antonio Pucci, brother-in-law of Francesco Sassetti, Lorenzo the Magnificent, Francesco Sassetti himself and his son Federico, destined to a religious career. Lorenzo is reaching out with his hand to Agnolo Poliziano, leading Lorenzo’s children upstairs: Giuliano di Lorenzo de Medici, the future Duke of Nemours, Piero the Unfortunate and Giovanni de Medici, the future Pope Leo X; behind them, the other teachers of the children of the Medici family: Luigi Pulci, the author of Morgante, and Matteo Franco, a primary school teacher of the Medici and canon of the cathedral. Their presence is a tribute to the family thanks to whose support he could have a career. Francesco Sassetti is indicating his children on the left od the scene, Galeazzo, Theodore I and Cosimo. 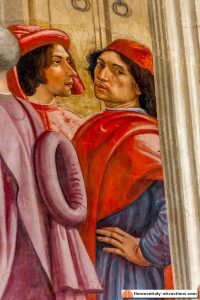 Ghirlandaio accurately represented their dignity and their clothing that testifies the belonging to rich Florentine bourgeoisie. The two side groups guide the viewer’s eye toward the center, to the religious scene. The composition, so original and perfectly harmonious, makes it one of the highest peaks of the art of Ghirlandaio. The Miracle of the Child of the House of Spini resurrected is at the center of the wall above the altar of the Sassetti Chapel, showing a posthumous miracle of Saint Francis, tied to the Sassetti family and not surprisingly shown at the midpoint of the cycle of frescoes. The saint was attributed the miraculous intervention that raised a child fell from a window of the Palazzo Spini, just in Piazza Santa Trinita, in front of the church. This fresco replaced the usual scene of the Apparition of St. Francis in Arles, mentioned in the original contract, and concludes the stories of the cycle. The miracle shows a view of Florence with the ancient romanesque facade of Santa Trinita, Spini palace, which is still there, the Gianfigliazzi palaces, a corner of the Minerbetti palace and the Santa Trinita bridge, designed by Taddeo Gaddi (before it was rebuilt later on design by Michelangelo). Even here we have many figures in the background, some are running, trying to save the child who’s falling from a window, some are riding horses, others seem to see the apparition of the saint in the sky. In the middle of the painting, we see the funeral of the child who suddenly raises, sitting with folded hands on a bier covered with oriental fabrics. St. Francis appears in heaven blessing him while on the two sides two groups of individuals (men on the right, especially women on the left) watch the scene. In these groups, which are distinguished by their expensive clothes and demeanor typical of Florentine merchant class, there is a large number of portraits of contemporaries, including members of the Sassetti family. The five women on the left should be the daughters of Francesco Sassetti (one facing the viewer will also appear, older, in the Tornabuoni Chapel frescoes), while the men right in front of them are their husbands or boyfriends. Among the friends of the house of Sassetti are maybe the portraits of Maso degli Albizi and perhaps Angelo Acciaiuoli and Filippo Strozzi the Elder. The last man on the right, looking at the observer, is the same painter, a self-portrait of Ghirlandaio in a fair position with one hand on his hips. Beside him, in profile, his brother-in-law Sebastiano Mainardi. In the top of the right wall, St. Francis goes to preach to the Sultan during the Seventh Crusade: to prove he’s right, Francis walks on the fire challenging the councilors of the Sultans to do the same. 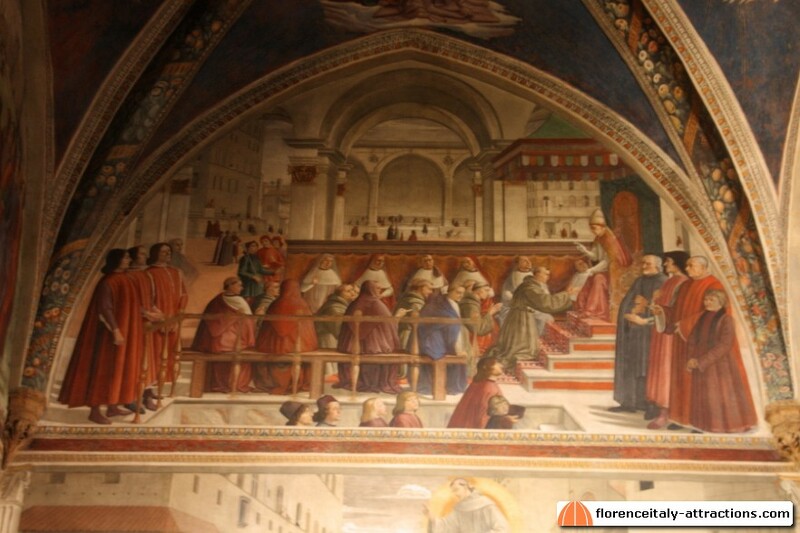 The composition follows quite closely the structure in the same fresco by Giotto in Santa Croce: the sultan in the middle, on the right St. Francis with his brothers and on the left the sultan’s advisers; the innovation is to represent a figure from behind in the foreground, which helps the observer to focus on the center of the scene. Particularly beautiful is the iridescent mantle of a counselor. There are no portraits in this lunette, and the background is generic. 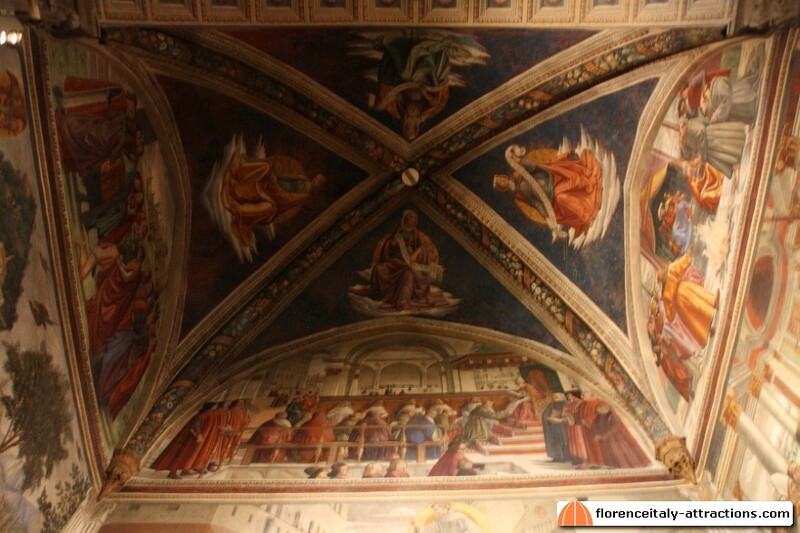 The scene at the bottom right of the Sassetti Chapel, depicting the Funeral of St. Francis, was performed in 28 days. The saint is lying dead on a bier in the middle of a great Renaissance church, with various figures around. The inspiration to Giotto in Santa Croce (the same movements of the monks for example) is quite clear, even if Ghirlandaio introduced several new elements, such as the monumental structure of the background, and the different level of emotions of the monks. The characters are placed in the background of an imposing classical architecture, crowded around the coffin of Francis. Some priests say prayers, three young clerics lead a processional cross and two candles, while the monks, gathered around the body of the saint, give vent to their grief. A man dressed in red, Messer Girolamo, is looking with disbelief at the wound in his side. Probably, to give a face to the friars of the scene, Ghirlandaio portrayed the monks of Santa Trinita and the nearby Franciscan monastery of Ognissanti. The three people on the right are a father, a son and a grandson, possibly related to the Sassetti family. To the right, again, a portrait of Poliziano and Fonzio, who suggested the subjects and themes of the entire cycle. The two tombs are placed at the bottom of the two lateral walls and are the work of Giuliano da Sangallo, trusted architect of the Magnificent. To the right is that of Francesco Sassetti and to the left that of his wife Nera Corsi. Both sarcophagi are made of dark basanite and are adorned with simple decorations in bas-relief and inscriptions in capital writing in Latin. The overall message of the Sassetti Chapel is that the exaltation of the active life of the individual, comforted by the virtues of the soul and the intellect and affections until the moment of death, according to the Christian view, is the beginning of a new life. The coming of Christ, the rise of Christianity, the renunciation of goods Francesco, allegories of death and rebirth in the reliefs on sarcophagi then become all linked together for the celebration of Florence and its new golden age, referring to the contemporary political and cultural environment, blending Christian and pagan themes according to the way initiated by the neo-Platonism of Marsilio Ficino. 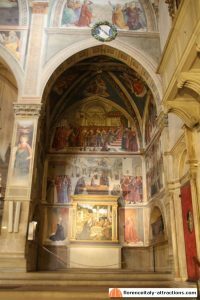 From the point of view of iconography it is generally believed that Ghirlandaio did not know the stories of the Basilica of St. Francis of Assisi, but certainly had seen those of the Bardi Chapel in Santa Croce. Not all scenes are of the same artistic level: obviously Ghirlandaio took care of those which are closer to the viewer’s eyes and those of the central wall, more visible, allowing greater freedom to his apprentices in the scenes to the sides and top.